Animal owners are no longer able to import medically important antimicrobials (MIAs), and most other veterinary drugs, for use on their own animals. What is an MIA? See Animal Owner FAASTsheet #3. Traditionally, there has been limited oversight by regulators and veterinarians of medications imported by animal owners for use in their own animals. Oversight is needed to ensure drugs are used appropriately and of good quality to reduce the risks posed to food safety, animal health, and the development of antimicrobial resistance. What Do These Changes Mean for Animal Owners? You are no longer able to import MIAs and most other veterinary drugs from other countries, even if you only intend to use them on your own (farmed) animals. Farmed animals include cattle, sheep, goats, pigs, chickens, horses, fish, bees, and mink. As of December 1st, 2018, animal owners will need to purchase MIAs from a veterinarian, pharmacy, or feed mill (for medicated feeds only) within Canada. A prescription will also be required to obtain any MIAs. See Animal Owner FAASTsheet #6 for more. List B includes certain, limited exceptions to this rule. These drugs can continue to be imported for own-use in farmed animals. An application can be submitted to include specific drugs on this list if they meet certain criteria. If you don’t already have one, establish a Veterinarian-Client-Patient-Relationship (VCPR) with a veterinarian in your area to prepare to December 1st, 2018. Check Animal Owner FAASTsheet #5 to learn more about a VCPR. Talk to your veterinarian about the products you can access through your veterinary clinic or local retail outlets (i.e. 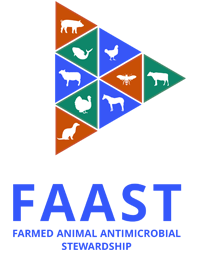 livestock medicine outlets) to ensure you have timely access to the drug products you need for your animals.